The presence of a Muslim farmer who saves cows and a Muslim archaeologist who wants a Ram temple in Ayodhya in the awards list obviously underline Prime Minister Narendra Modi government’s priorities in identifying its own brand of ‘good Muslims’. But Modi and the BJP cannot be singled out for selecting Muslims of their own choice. Congress governments in the past have also given Padma Awards to ideologically favourable Muslims. There was overwhelming opposition to the British practice of giving title and awards to ‘loyal’ Indians, especially in the late 1940s. The Constituent Assembly was keen to abolish this practice and expand the scope of the right to equality. This consensus led to Article 18 (1) of the Constitution, which clarifies that ‘no title, not being a military or academic distinction, shall be conferred by the State’. The Padma Awards that began in 1954, however, were different from the titles offered by the British state. These awards, technically speaking, were instituted to recognise the ‘significant contributions’ of Indian citizens. This idea of contribution went well with an interesting feature of Muslim intellectual discourse in the aftermath of Partition. People like Maulana Azad, Hussain Ahmad Madani and Syed Abid Husain began to highlight the contributions of Muslims in the making of India. The monuments built by Muslims, the syncretic Sufi-Bhakti traditions and the role of Muslims in the freedom movements were invoked to favour the unity-in-diversity thesis. Arguments of this kind helped the Nehruvian state to work out an overtly secular imagination of the Indian nation – especially in the 1950s when the residual post-Partition suspicion of Muslims was still rife. So, the Padma awards emerged as a crucial symbol to legitimise Muslim contribution. This led to a distinctive postcolonial political norm where governments, irrespective of political-ideological orientations, tried to produce an inclusive list of Padma Awards every year in which Muslims names figured prominently. A systematic study of Padma Awards underlines this norm. A total of 4,501 Padma Awards have been conferred in the period between 1954-2018, out of which 323 have been given to Muslims (including six Bharat Ratnas). It means the Muslim share in the Padma Awards is approximately 7 per cent. Given the overall educational backwardness and economic marginalisation of Muslims in India, this figure cannot be called unimpressive. Even as the BJP accuses the Congress of ‘Muslim appeasement’, it continues this tradition. 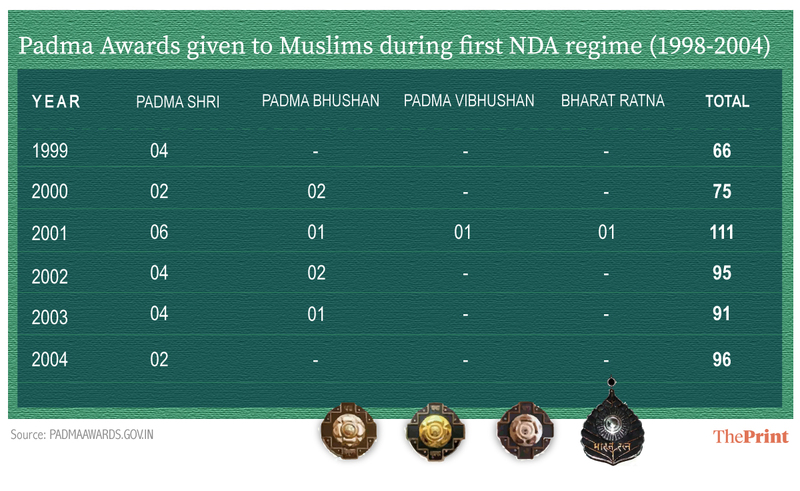 During the first NDA regime (1998-2004), 534 Padma Awards were distributed, of which 30 were given to Muslims (including a Bharat Ratna to Ustad Bismillah Khan) — constituting about 6 per cent. So, the Atal Bihari Vajpayee government also continued the principle of Muslim inclusion. The total number of Padma Awards given to Muslims under NDA I was 534. The Modi regime, however, does not stick to this average. The government has given a total of 424 awards (till 2018) and only 15 Muslims are included in this figure. The Muslim share is down to 3.5 per cent. Should this be read as a clear sign of the Hindutva agenda of Modi government? But, that would be a facile reading. Modi did not disown the tradition completely. Instead, his government tried to legitimise its own reading of Muslim presence through Padma Awards. The postcolonial story of Padma Awards underlines two crucial and related points. First, the Padma Awards reflects the state’s imagination of Indian society. It shows that all political parties do recognise Muslims as an inseparable constituent of the nation. Despite the varying good Muslims-bad Muslims definitions, there is a consensus that the idea of India cannot be imagined without Muslims. Second, the Padma Awards should not be overstretched to the debate on Muslim representation. The selected Muslim individuals, technically, are not identified on the basis of their religious identity (although one cannot ignore the significance of ‘Muslim names’ in this process). Nor do they represent the interest of Muslims. Hence, the expectation that the ‘Muslim’ Padma Award winners must respond to so-called Muslim issues is untenable. This cannot be cited as an instance of Muslim victimhood. In fact, it underlines an unwritten norm of statecraft in India, which forces even the Modi government to identify the Muslim presence in its idea of India. ThePrint is publishing three series on minorities in India by Hilal Ahmed. The ‘Sarkari Muslim’, ‘Minority Report’, and ‘Line of Law’ will trace the political journey of Muslims in the country. This is the second article under Line of Law.